Ouchi is a small town in northern Saga Prefecture that became part of Karatsu city in 2005. It has a population of just over 9000. The average age of residents of Ouchi is around 57. The town flower is the アジサイ (hydrangea) (they really love it) and the town tree is the スギ (Japanese cedar), but it’s not as popular as the hydrangea! There is a volunteer fire brigade and they’re big on community sports. Ouchi is the point at which four rivers meet – the Matsuura river, the Kyuragi river, the Hirayama river, and the Ikisa river. The name Ouchi comes from the description of the town as a meeting point for the rivers. There are also several mountains of between 300 and 900 metres. 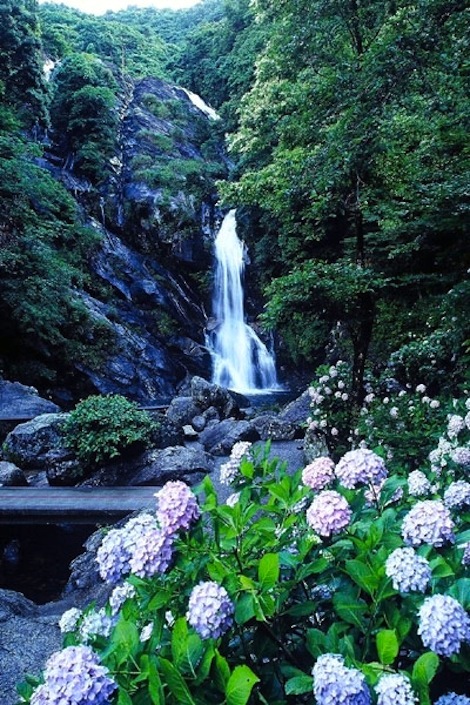 So, if you like hydrangea, elderly people, stone carvings and rivers – come to Ouchi for a splendid time! One municipal ALT lives in Ouchi and works at the town’s one Junior High and two Elementary schools. They also sometimes work at other schools in Karatsu. If you`re planning on visiting this beautiful corner of Karatsu, be sure to check out our Ouchi travel page before you go! The main train station, Ouchi Station (相知駅), is on the Karatsu Line of JR line running from Nishi-Karatsu Station in Karatsu to Saga. A smaller line, part of the Chikuhi Line, runs from Yamamoto Station of Karatsu City, through Nishi-Ōchi Station (West-Ōchi) to Imari Station in Imari City, a notable pottery centre in Saga Prefecture, along with Karatsu and Arita. Ouchi is on the 203 route from Karatsu to Saga City.